1 For the cupcakes: heat the oven to 180°C (160° fan) 350°F gas 4. Place paper cases in a 12 hole bun tin. 2 Put the butter, sugar, eggs, flour and baking powder into a mixing bowl and beat with an electric whisk for 1-2 minutes until the mixture is light and well mixed. Lightly fold in the ground almonds and almond extract. 3 Spoon into the paper cases and bake for 20 minutes until risen and golden. Leave in the tin for a 5 minutes, then place on a wire rack to cool. 5 smooth and thick. Stir in a few drops of food colouring. 6 Spoon the frosting on the cakes, allowing it to trickle down the sides. 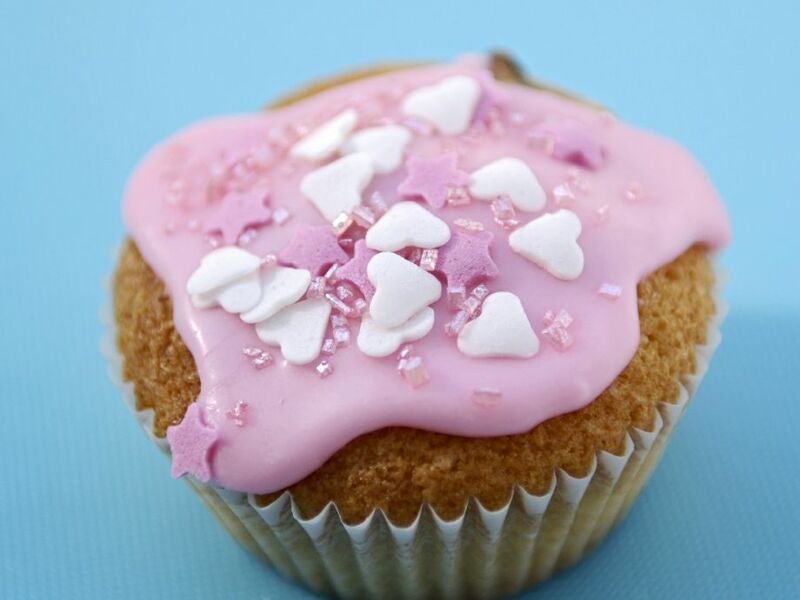 Sprinkle with the sugar crystals and decorate with sugar hearts and stars before the frosting sets.